"You want it darker? I’m not sure I do." 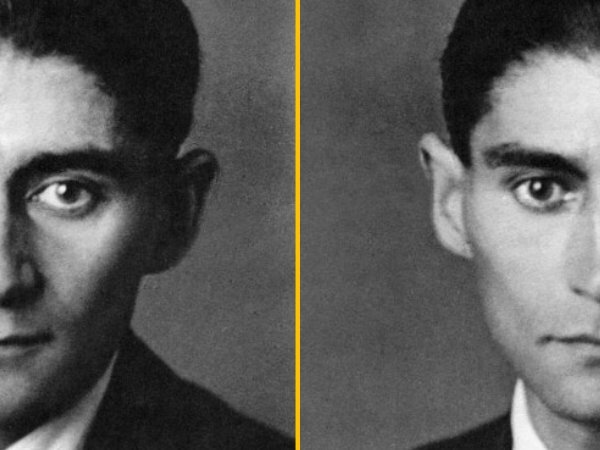 We tackle winter solstice and Chanukah, darkness and light, and a note from Kafka. Where is this darkness coming from? In Franz Kafka’s short story, Before the Law, a man spends his whole life waiting. His eyesight begins to fail, and he doesn’t know “whether the world is really darker or whether his eyes are only deceiving him”. The story conveys a world in which we live with uncertainty, fear and loneliness, with ageing and death, in which we don’t know if we are holding ourselves back or being held back, whether the world is really darker or our eyes are only deceiving us. Some of us may have felt increased darkness recently. We have seen the rise of political leaders and movements that have capitalised on fear of entire religious and national groups. We, also, at this time of year, simply experience less daylight, as some of us reach for our vitamin D supplements and the switch to our Seasonal Affective Disorder bright light to counter the anxiety and fear, the sadness, that can come with darkness. We may be more afraid of the dark than we care to admit. In literal darkness I fear the dangers that lurk, people on the street, mice in our London apartment, and I intuit that I can do nothing about these dangers, that I don’t know where I’m going. Fear and darkness can shade into an amorphous, exaggerated threat. And the night like day will be illuminated, the darkness like light. You know my sitting and my rising, and understand my thought from afar”. “Both behind and in front You hedge me in [with the root tsadik-reish-reish] and set Your hand upon me (presumably threateningly)”. In Psalm 139, we confront darkness, and tension between being constricted and connected. What is the story of Chanukah? Our Rabbis taught: When Adam HaRishon (the first human, Adam) saw the day getting gradually shorter, he said, ‘Woe is me, perhaps because I have sinned, the world around me is being darkened and returning to its state of chaos and confusion; this then is the kind of death to which I have been sentenced from Heaven!’ So he began keeping an eight day fast. But as he observed the winter solstice and noted the day getting increasingly longer, he said, ‘This is the world’s course’, and he set forth to keep an eight day festival. His 8 day festival is our Chanukah. We are also told in this text that the way to remember that the winter equinox is the pivot in a sequence of days in which the world at first gets darker, before getting lighter, is a line from our psalm, 139: “After and Before, You shape/ hedge me in….”. The Rabbis, in telling this story of Adam, and bringing our Psalm to its texture, shape Chanukah as a response to the world’s darkness. Chanukah comes just after the winter equinox, the shortest day of the year. Furthermore, because Chanukah takes place in the last week of the month of Kislev (rather than in the middle of the month, like Yom Kippur, or Pesach) on each day of Chanukah, until the last couple, the moon is getting thinner and thinner. Chanukah illuminates the darkness, at the darkest time of the year, highlighting the ever-varying shades between light and darkness. In our story of Adam, there is a remarkable turning point. He sees the world getting darker. He imagines himself as the centre of the world, and fears that he has caused the simultaneous death of himself and everything. In response he fasts, and the day gets longer. How does he respond, and how might he have responded? He might have assumed that his repentance and fasting had caused the reversal, and yet he realizes that there is a world outside of him- “this is the way of the world”. It is a moment of maturity, of growing into an understanding that there is change, and a greater perspective. How do we respond to darkness? “The School of Shammai maintains: on the first day eight lights are lit and thereafter they are gradually reduced; but the School of Hillel says: on the first day one is lit and thereafter they are progressively increased…”. We follow the School of Hillel, adding a candle a candle each day. As the moon gets thinner, in those dark days, we may in Chanukah recognise the great darkness in the world, yet we also resolve to add a little light, for ourselves and for passers-by seeing the candles in our window. This year, each night of Chanukah I might recognise one thing I am grateful for, and one thing I want to do to bring more light to the world. There is a surge of relief when we can express with honesty our fear and darkness. Sometimes I don’t know whether the world is really getting darker or whether my eyes are deceiving me. Either way, later this month, we badly need to be with people and bring a little light.